Personalized Recyclable Grocery Totes Custom Printed in Bulk. Promotional, Inexpensive. Eco-Friendly. 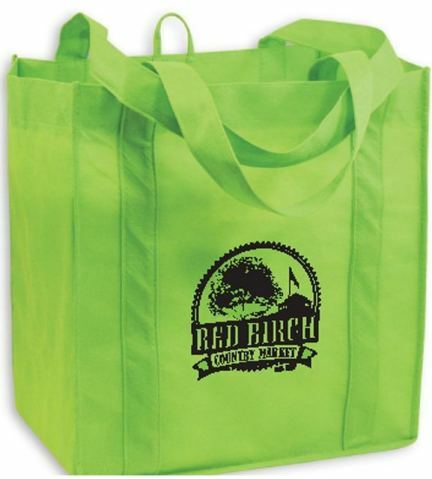 Bulk eco-friendly grocery totes, custom imprinted with your logo or message. Our sturdy, eco-friendly, grocery totes are available in many colors: Black, Burgundy Red, Pink, Lime Green, Forest Green, Navy Blue, Orange, Red, Royal Blue, Purple, Teal Green, Athletic Gold. We also supply wholesale blank (not imprinted) recyclable grocery totes for $1.69 each. Budget Prices in the USA for wholesale recyclable grocery totes . American clients pay no taxes. We will send you a proof for your approval before production. Prices include your 1 color, 1 location custom imprint. (not imprinted) grocery totes for $1.69 each (minimum 100). *GSM is the standard measurement for weight and quality of material. Higher GSM values represent stronger, more durable polypropylene resulting in greater reusability. Our polypropylene exceeds all accepted industry and global standards for quality and strength. Fabric - Polypropylene 90GSM* Nonwoven, with the feel of cloth. Colors: Black, Burgundy Red, Pink, Lime Green, Forest Green, Navy Blue, Orange, Red, Royal Blue, Purple, Teal Green, Athletic Gold (see photo).